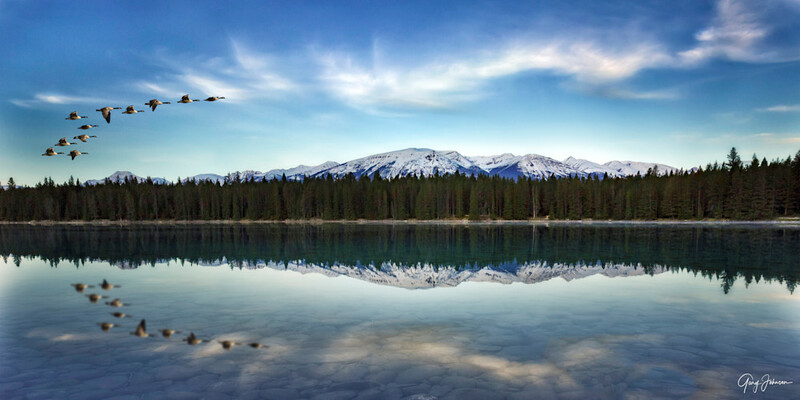 "Lake Annette" is a glacial fed lake about 8–10 kilo­me­ters from the town of Jasper in Alberta, Canada just off the Yel­low­head High­way 16, alongside Athabas­ca Riv­er. We arrived at this location before sunrise to photograph the snow-covered mountain reflection. I was most attracted to the glassy water and the reflected white clouds. The geese in this picture were added in post-production even though I saw ducks and a bald eagle but weren’t able to capture them in my original image.